Let’s investigate different ways of creating a coordinate plane. The following data were collected over one December afternoon in England. Which set of axes would you choose to represent these data? Explain your reasoning. Explain why the other two sets of axes did not seem as appropriate as the one you chose. Here are three sets of coordinates. 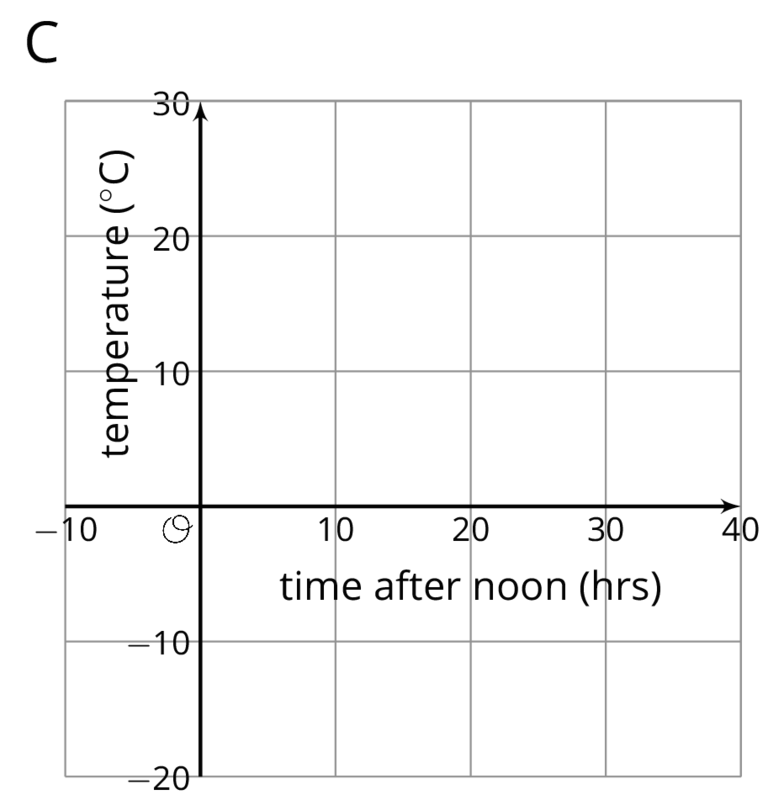 For each set, draw and label an appropriate pair of axes and plot the points. How are the axes and labels of your three drawings different? 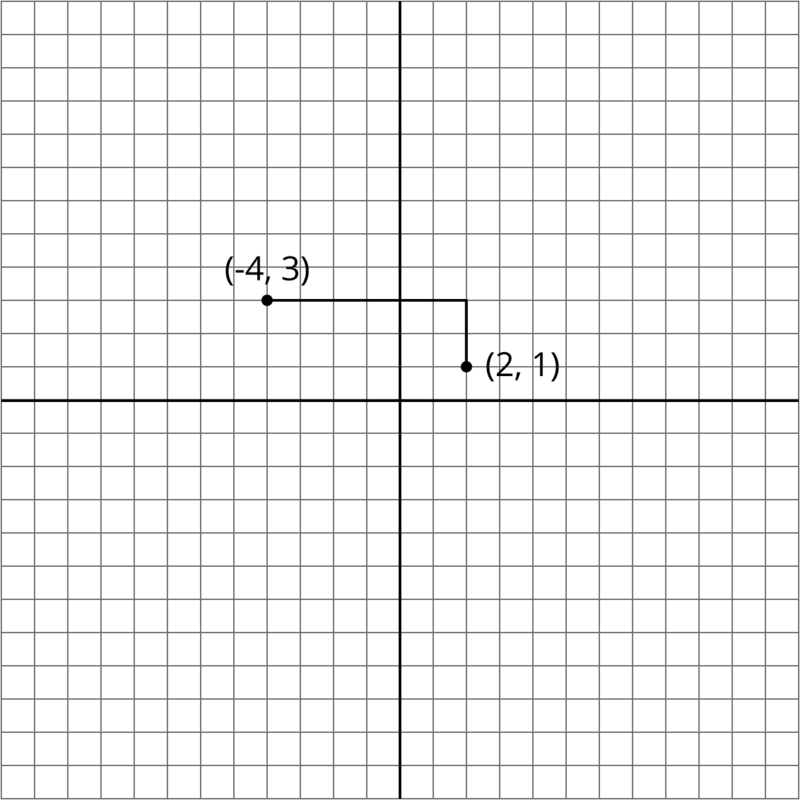 How did the coordinates affect the way you drew the axes and label the numbers? Here is a maze on a coordinate plane. 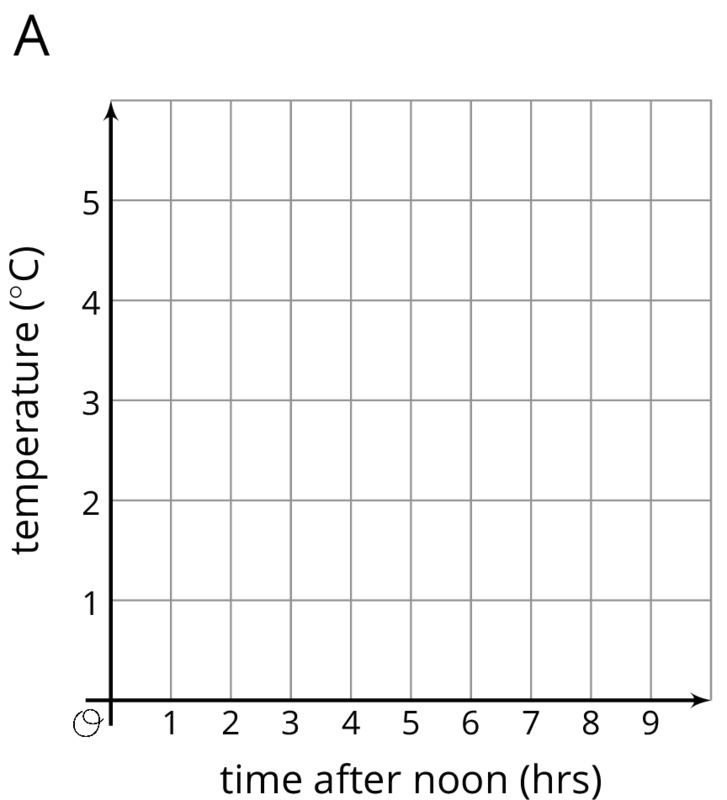 The black point in the center is (0, 0). The side of each grid square is 2 units long. Enter the above maze at the location marked with a green segment. Draw line segments to show your way through and out of the maze. Label each turning point with a letter. Then, list all the letters and write their coordinates. Choose any 2 turning points that share the same line segment. What is the same about their coordinates? Explain why they share that feature. To get from the point $(2,1)$ to $(\text-4,3)$ you can go two units up and six units to the left, for a total distance of eight units. This is called the “taxicab distance,” because a taxi driver would have to drive eight blocks to get between those two points on a map. Find as many points as you can that have a taxicab distance of eight units away from $(2,1)$. What shape do these points make? 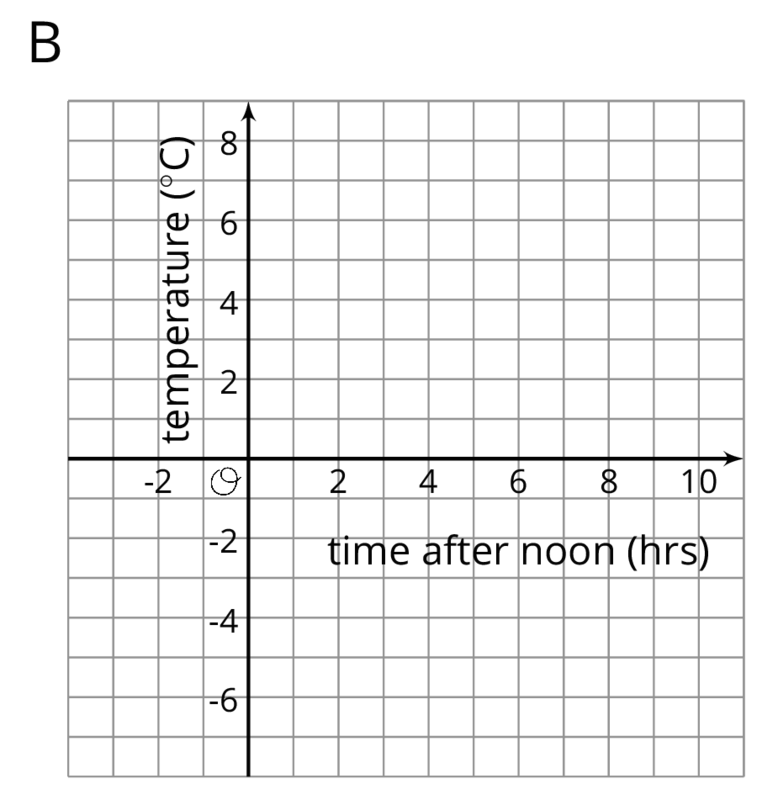 The coordinate plane can be used to show information involving pairs of numbers. When using the coordinate plane, we should pay close attention to what each axis represents and what scale each uses. Suppose we want to plot the following data about the temperatures in Minneapolis one evening. We can decide that the $x$-axis represents number of hours in relation to midnight and the $y$-axis represents temperatures in degrees Celsius. In this case, $x$-values less than 0 represent hours before midnight, and and $x$-values greater than 0 represent hours after midnight. On the $y$-axis, the values represents temperatures above and below the the freezing point of 0 degrees Celsius. 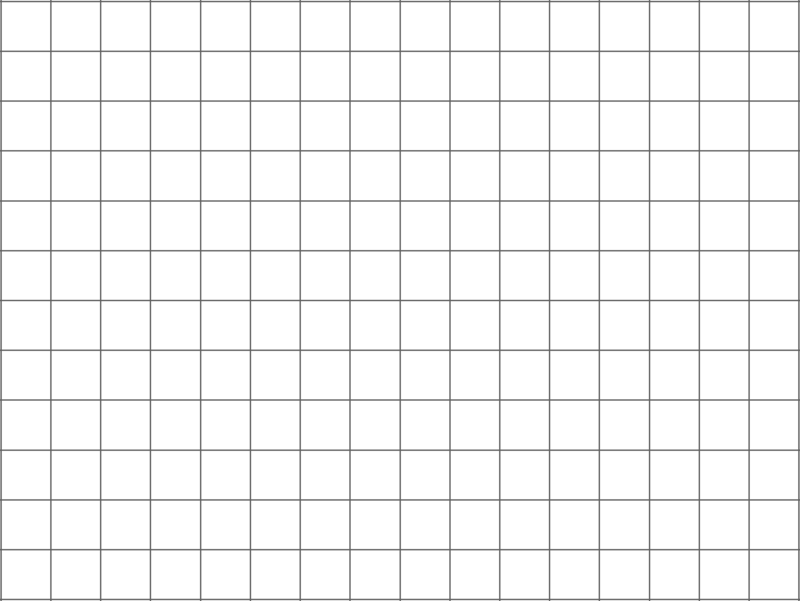 The data involve whole numbers, so it is appropriate that the each square on the grid represents a whole number. On the left of the origin, the $x$-axis needs to go as far as -4 or less (farther to the left). On the right, it needs to go to 3 or greater. Below the origin, the $y$-axis has to go as far as -8 or lower. Above the origin, it needs to go to 3 or higher. Here is a graph of the data with the axes labeled appropriately. 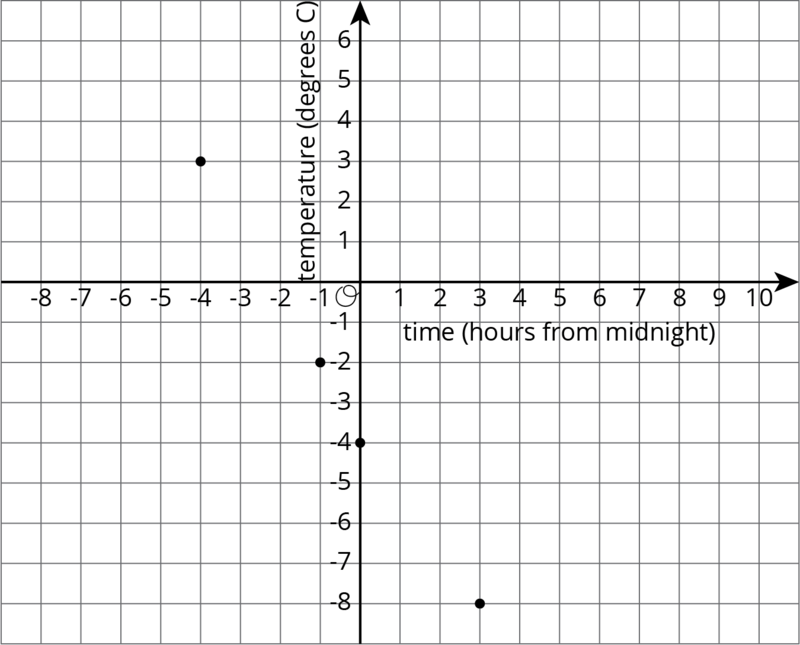 On this coordinate plane, the point at $(0, 0)$ means a temperature of 0 degrees Celsius at midnight. The point at $(\text-2, 8)$ means a temperature of 8 degree Celsius at 2 hours before midnight (or 10 p.m.).